YouTube Channel SKM shows off how to make a quadrotor drone from cardboard. Well, specifically ,a model of a quadrotor drone; this one doesn’t work as a drone as-si. Still, a good DIY project is a good DIY project, after all. Gulf Breeze, FL, September 14, 2017 — Duke Robotics, Inc, a developer of advanced robotic systems, announced that Israel’s Ministry of Defense has endorsed Duke Robotics’ TIKAD drone as innovative future battlefield technology. “We are pleased with the endorsement of the Israeli ADW (Administration for the Development of Weapons at the Ministry of Defense) for our technology and its capability in providing a real solution in saving lives and changing the course of the modern battlefield,” said Raziel Atuar, Duke Robotics CEO, former Israeli Special Mission Unit commander. With the mission to save lives and to empower troops with immediate aerial support, Duke Robotics designed the TIKAD — a fully robotic weaponry system on an airborne platform, which they refer to as The Future Soldier. The company announced in August that it’s offering up to $15 Million of common stock qualified by the SEC under Tier II of Regulation A+. Now, anyone, not just wealthy investors, can purchase stock and own a part of this award-winning company. See DukeFutureSoldier.com. As the classic army versus army confrontation on the battlefield has become increasingly rare, guerrilla warfare is now more commonplace. Developed by former Israeli military and Special Mission Unit officers to address warfare’s changing landscape, the TIKAD is remotely operated by troops, user-friendly and easily carried into the field. The company’s proprietary robotic stabilization technology enables the TIKAD to absorb the recoil of a weapon, allowing for pinpoint targeting and shooting accuracy that can protect troops in a variety of dangerous situations. By reducing the need for ground troops, the TIKAD represents a major step towards minimizing military and civilian casualties and the technology is gaining support on a global basis. Duke Robotics, Inc. is a developer of advanced robotic systems technology developed in Israel. With the mission to save lives and to empower troops with immediate aerial support, Duke Robotics has developed the TIKAD — The Future Soldier. Duke Robotics innovative robotic system is adaptable to other military platforms, such as land vehicles, marine boats, etc. as well as adaptable to civilian purposes. 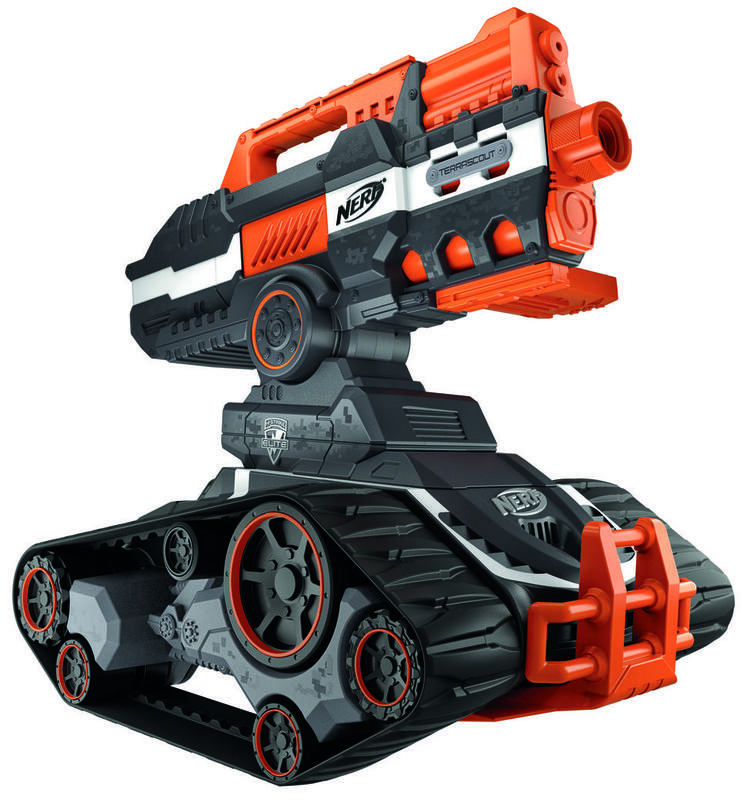 NERF’s TerraScout, the RC NERF blaster drone that was unveiled back in June, is now available in stores. The TerraScout is a blaster drone that features a 720p video camera, which can be controlled via an included remote; the remote features an integrated LCD screen for live viewing. An additional detail that has come to light is users can record the video feed onto an SSD card. The drone itself comes complete with an 18-dart mag/clip, which it fires full-automatic, and is compatible with NERF N-Strike barrel extensions. It is also capable of traveling on (mostly) all terrain via its tank-like treads. MSRP is still $200, so this one might have to wait until Christmas. AirDog is a quadcoptor equipped with a GoPro camera designed to follow the operator. The operator achieves this by wearing a specialized ‘AirLeash’, a device that tracks movement and sends control commands to the AirDog unit. The AirDog was developed for Action Sports such as surfing or motocross, to further sports videography. It’s currently up for funding on Kickstarter, where it has already exceeded its funding goal. Hex is the world’s first personalized smartphone controlled nanocopter. It comes in a kit that snaps together and requires no soldering; the designers provide many custom shells, and even more designs can be 3D printed by the user. The platform is completely open source and is compatible with Arduino, so it’s easy to change the source code and/or hardware to specify it for different tasks. The app used to control Hex is free, and uses Bluetooth 4.0 for efficient long distance communication.